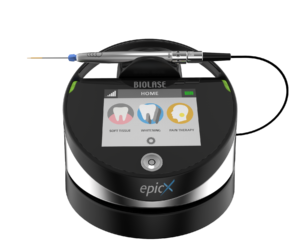 This laser has a narrow fiber tip that can gently enter the sulcase between the gum and tooth. It selectively targets inflamed tissue and disease causing dark pigmented bacteria. It is useful during conventional cleaning appointment to reduce bacteria. It is also used during root planing to remove inflamed gingiva with pain free healing.